Lake Santeetlah NC Lake and Mountain View Lakefront Home with Private Dock for Sale. Robbinsville, Graham County NC Area. Santeelah, Santeela, santeetla. Lake Santeetlah NC lakefront home with dock for sale. Lake and Mountain View Lakefront Homes with Private Dock for Sale. Robbinsville NC lakefront homes for sale. 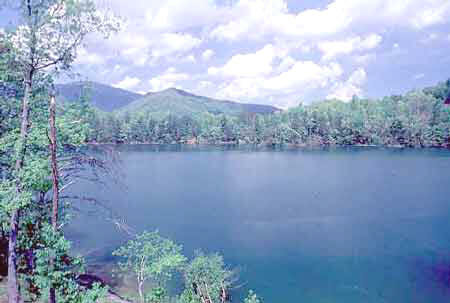 NC Mountain and lake view homes, cabins near or on Lake Santeetlah and Fontana Lake for sale. Western North Carolina Mountain homes for sale. Lakefront log homes, cabins, waterfront homes, lake front homes, lakeside house, river homes, gated community golf course development homes in the NC Smoky Mountains. Robbinsville, Graham County trout stream cabins, vacation homes for sale in the NC Smoky, Smokey, Smokies. Santeetla, Santeela. Lakefront Home with Private Dock for Sale. Imagine Yourself Here - Almost new three level home on Lakefront Santeetlah. This property has it all! Three levels of decking including screened porch on main level. Spacious 2.5 bath with 2 large bedrooms and bonus room. Hardwood floors and Berber carpet. Fully equipped kitchen. Central heat/air, stone wood- burning fireplace in great room, and gas fireplace on lower level. Located on the deepest water just behind Santeetlah Dam. Only a few steps to your own private dock. Beautiful mountain views of USFS. Convenient parking at entrance. Will not last long!